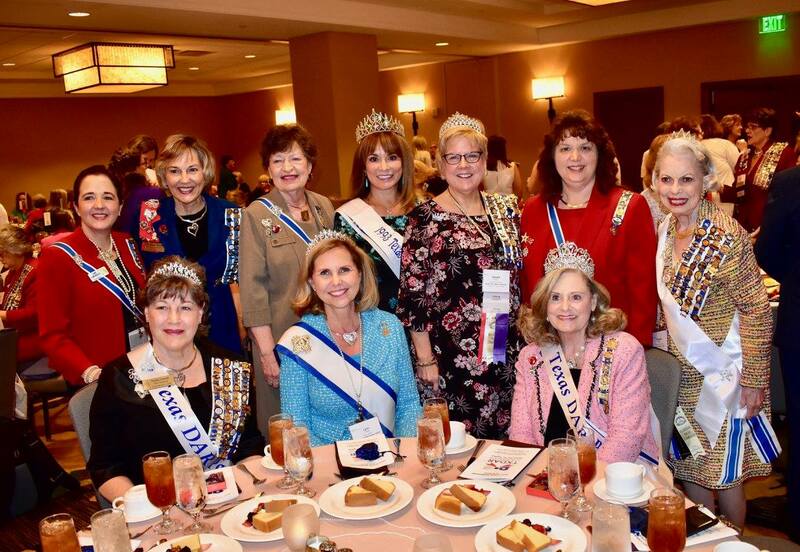 Texas Daughters were honored to welcome President General Ann Dillon, to our 119th Texas State Conference in San Antonio on March 7 and 8. 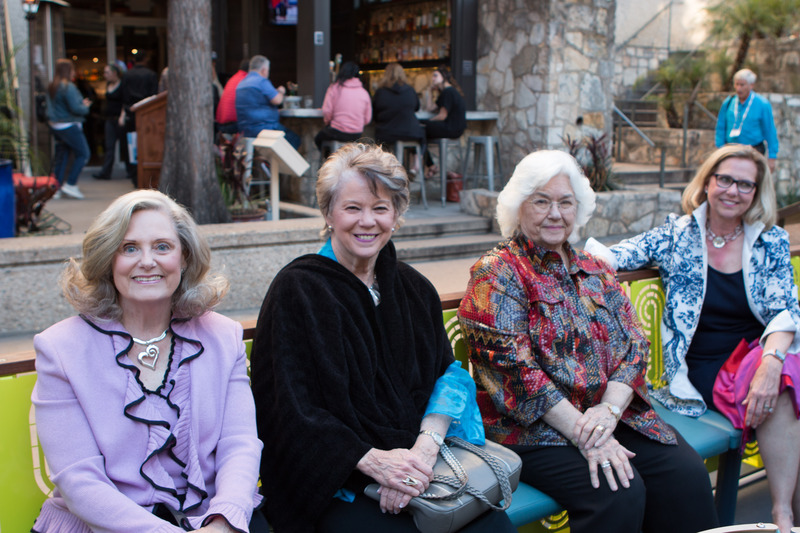 Texas State Executive Board, Honorary State Regents and out of State Regents attending as guests greeted Mrs. Dillon Wednesday evening prior to conference with a riverboat tour of the San Antonia Riverwalk along the San Antonia River. The weather was perfect for our tour of San Antonio history and landmarks and our fabulous dinner at Club Giraud. TXDAR Members attended a special planned Flag Retirement Ceremony at the Alamo conducted by TXDAR and the Boy Scouts of America. Thursday morning began with workshops and a special El Camino Real Forum. Following the State Chairs’ Club Luncheon, Mrs. Dillon hosted the President General’s Afternoon Tea for members of Heritage Club and Founders Club. 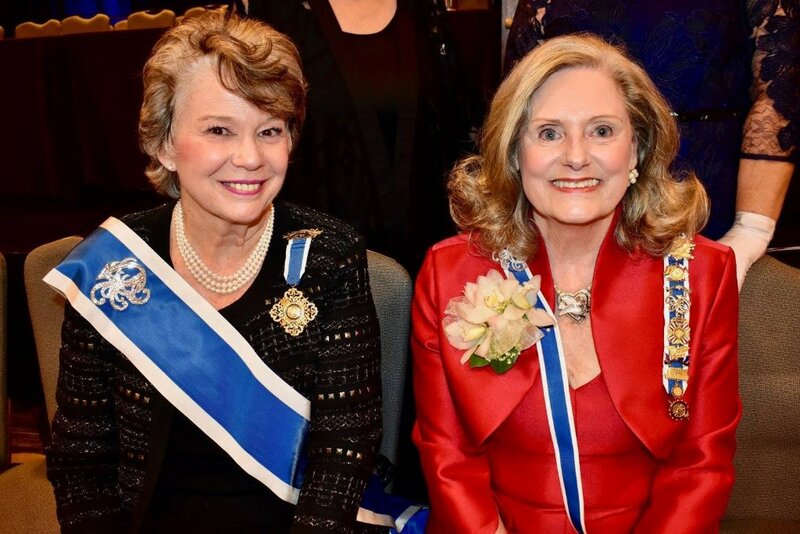 Prior to Opening Night, Mrs. Dillon was TXDAR’s honored guest at the State Officers’ Club Dinner where she served as Personal Page to Honorary State Regent, Donna Raymond, who installed new officers for the upcoming year. Opening Night Processional was to bagpipe music provided by the San Antonio Police Pipe and Drums. All Chapter Regents then entered with Chapter Banners and were recognized by Districts. The evening featured Nicole Filmore, KDS DAR Student singing the National Anthem and TXDAR awards for Texas Junior Membership, Women in the Arts and Outstanding T.S.C.A.R. Member. Mrs. Dillon was the featured speaker of the evening. She was presented with a Texas State Charm for her bracelet, a contribution to her President General’s Project, a certificate from Texas Governor Gregg Abbott, making her a ”Texas Citizen” and a copy of TXDAR’s Book on the First Ladies of Texas. Following the recessional, the Cameo Club Ice Cream Social, in honor of Mrs. Dillon and out of state regents from FL, LA, MI, NH, SC and WV, was held with musical entertainment provided by Nicole Filmore. The DAR School Breakfast featuring Heather Green, Executive Director Kate Duncan Smith DAR School and student representatives, Taylor Corbin and Charles Montgomery was held on Friday. Josh Mullins, Director of Advancement for Hindman Settlement School brought greetings from Kentucky. Other events during the day included the Junior Membership Luncheon and the 50+Members Club Reception. Saturday breakfast introduced the newly published TXDAR book, “Courage, Charm and Character,” the story of the First Ladies of Texas and the Historic Gown Collection at Texas Woman’s University. This book is a State Project of TXDAR to raise money for the preservation and restoration of the gown collection presented to TWU in 1940 by TXDAR as their NSDAR Jubilee Project. The Education Awards Luncheon featured Mrs. Cecilia Phalen Abbott, First Lady of Texas as our guest. She spoke on the value of education, her emphasis on volunteerism and endorsed the new book on Texas First Ladies. At the close of our afternoon business session the graduates of the DAR New Members and DAR New Horizons Courses were recognized with a graduation ceremony. National Defense Evening honored our featured speaker, Col. Mitch Bell, USMC, Retired with the DAR Medal of Honor. Other awards presented were the DAR Distinguished Citizen Medal, Outstanding Veteran Volunteer and Outstanding DAR Service for Veterans. On Sunday a Memorial Service was held in remembrance of all TXDAR members who lost their lives during the past year. Our conference closing event was held following this service; TXDAR Patriotic Prayer Breakfast honoring all veterans. The speaker, author Kristine Woods, spoke on her book, “Run for the Wall” and the annual patriotic event by Vietnam Veterans and those bikers who support this cause. She was presented the DAR Distinguished Citizen Medal and Certificate. All Veterans in attendance were recognized and honored. TXDAR had a wonderful 119th State conference with 1100 in attendance. We are grateful that Mrs. Dillon joined us for Opening Night.